The Woolshed Sessions: Did you catch the Interview with Jess Chambers and Age Pryor? Last Thursday on "The Adventures of the Coffeebar Kid" (Thurs 6PM) We were honoured to have the multi talented Jess Chambers (Solo Work, Rhian Sheehan) and Age Pryor (Solo Work, Wellington Ukekle Orchestra, Fly My Pretties) in the studio to talk about their latest project : The Woolshed Sessions. The Woolshed Sessions music was captured on an improvised recording set-up; essentially a borrowed collection of nice microphones plugged into a tired old computer as the musicians worked four days straight, morning, afternoon and night. The tunes are mostly fresh songs written by various members of the eight strong collective. These songs were jammed and then recorded ‘live’ - everyone singing and playing together, often with many attempts made until getting a version down that was felt to be ‘the one’.Throughout is the ambient resonance of the space the music was created and recorded in – a converted woolshed with bare timber floors, lined with plywood and clad in corrugated iron looking across the Takaka Valley. 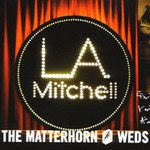 Just in LA Mitchell the Canterbury Jazz/Soul Singer is in Town to release here new album "Lve at the Matterhorn"
Background:: The evening of April 23, 2008 was a watershed moment for LA Mitchell as she prepared to perform. This was no ordinary gig, nor was it an ordinary venue. It was a triumphant return to Wellington to play at the world famous Matterhorn, following in the giant footsteps of Fat Freddy's Drop at the same venue that catapulted them to heights never before reached in NZ music. For the entirely independent Kiwi musician, the performance represented a significant new stage in her career, when she would build on the success of her acclaimed 2007 album Debut with an album that would solidify her status as one of the rising talents of homegrown music. LA Mitchell: Live at the Matterhorn is a gorgeous album of her original music spliced with new tracks and reinterpretations of classics. The album sees Mitchell uncork a sparkling collection of seductive soul and jazz, that reveals her undeniable talent as both a singer-songwriter and musician.